Stone & Wood have released the first beer in an offshoot series focusing on far more experimental beers than you'd normally expect from the brewery – and it's one that's as alliterative as it is pop culturally apposite. Bearing both curly Cs and kicking Ks, not to mention a rather stern-looking ruler, Counter Culture volume one is, like the hit film of recent months, a Killer Kween. First, some stats. The beer – an imperial Berliner Weisse – features no less than 1.2 tonnes of raspberries. It tips the scales at 7.6 percent ABV. It comes in tallboy tinnies. And the plan is to follow up with a new Counter Culture release every eight weeks, which might be a new recipe or something plucked from Stone & Wood's Pilot Series vault. As for the liquid, well, the 1.2 tonnes of raspberries do what you'd want them to do: not only is there a full and rounded raspberry character from lights out to chequered flag, but the beer is as pink as the cans from which it's poured. For all its heft, it's lacking in rough edges, instead balancing those summery fruits with a soft creaminess and gentle acidity and the lightest of spiciness. We live in an era when big beers are released every week and, when done well, often come with the "dangerously drinkable" tag. 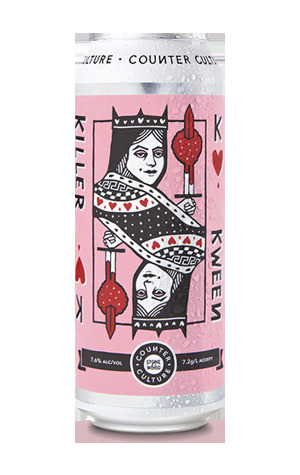 Were there to be a trophy for such things – weighing booze content against the ease with which a beer slides down – Killer Kween would attract the shortest of odds. There's a launch party at The Mill as part of Brewsvegas 2019 on March 18. Then the beer is on sale nationwide.